You will receive a beautiful notebook filled with nutrition information, 5 incredible recipes and a tote bag. Tickets are $35 per person. Bring a friend or family member! ***Dr. Yami Lancaster is a community pediatrician and the owner of Nourish Wellness who is passionate about health and nutrition. She believes in the power of a healthy diet. She is a certified Food For Life instructor through the Physicians Committee for Responsible Medicine and has a certificate in plant-based nutrition through the eCornell T. Colin Campbell Foundation. 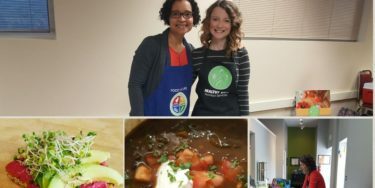 She promotes plant-based diets for children at www.veggiefitkids.com. She is a fellow of the American Academy of Pediatrics and a member of the American College for Lifestyle Medicine. She is also a certified Health and Wellness Coach. You can find out more about her private practice at www.NourishYakima.com.